The holiday party season is here. Your soiree schedule is set. Before you know it, you’ll be reconnecting with colleagues, spreading holiday cheer with friends, and maybe even stealing a few mistletoe kisses — wink, wink. But not at the company party, of course! The company holiday party can be fun and festive, but you always want to remember that it’s still a professional function. The goal is to strike a balance between formal and casual curly updos. Have fun, but don’t go haywire. Show a different side of yourself, but not too different. Argh! The etiquette rules may wear on your nerves, but your party look doesn’t have to. 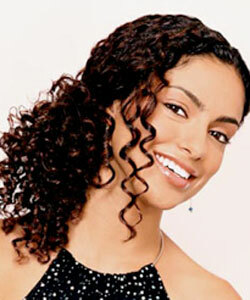 First, style your curls as usual, setting them with your favorite products and creating a strong part. If you normally aim for the center, try a side part — or vice versa. “You want to look different from how your work colleagues normally see you, without going overboard,” says Rodney Cutler of New York’s Cutler Salon. Sweep one side back with two or three decorative bobby pins. You can roll your curls back in one or two sections to make it a little more formal, or loosely sweep your textured tresses back to one side for a more relaxed, but still-stylish look. The glitzy bobby pins add a seasonal effect, so don’t be afraid to show them — they’re part of this curly updo. Pull a few strands out around your hairline to frame your face. If needed, re-wet the loose pieces and using your finger, curl them in place. Blasting the strands with a bit of heat while wrapped around your finger will help them to set. The loose strands should be frizz-free and well-defined. Finish the look off with a light mist of hairspray to keep the curls in place and a shine spray to make sure that the holiday lights shine off your mane. Try out a quick & easy curly twist hairstyle for your next holiday party — at the office or at home! At this event, you’re only festive, never flashy. No need to be paranoid, but do remember that someone (maybe your boss) will be watching you, so skip the drinking games!